Ballina (; Irish: Béal an Átha, meaning "mouth of the ford") is a town in north County Mayo, Ireland. It lies at the mouth of the River Moy near Killala Bay, in the Moy valley and Parish of Kilmoremoy, with the Ox Mountains to the east and the Nephin Beg mountains to the west. The town occupies two baronies; Tirawley on the west bank of the Moy River, and Tireragh, a barony within the County of Sligo, on its east banks. The population of Ballina is 10,361 according to the 2011 census (including environs it is 11,086) and is Mayo's largest urban area. According to Encyclopædia Britannica the first signs of settlement on the site of the town dates from around 1375 when an Augustinian friary was founded. Belleek, now part of the town, pre-dates the town’s formation, and can be dated back to the late 15th century, or early 16th century. However, what is now known as Belleek Castle was built in 1831. Ballina was officially established as a town in 1723 by O'Hara, Lord Tyrawley. The Dolmen of the Four Maols is located on 'Primrose Hill' behind Ballina's Railway Station. The dolmen dates from c2,000 B.C. and is sometimes called locally the 'Table of the Giants'. Legend has it that the dolmen is the burial place of the four Maols. The four Maols murdered Ceallach, a 7th-century Bishop of Kilmoremoy and were quartered at Ardnaree - the Hill of Executions. Tradition says that their bodies were buried under the dolmen. The Belleek estate once occupied lands from the Moy River to the modern-day Killala Road. This included part of the "Old French Road" which General Humbert marched on from Killala, and beside part of which in the Killala Road-Belleek area was Belleek’s reservoir – presumably destroyed in the construction of Coca-Cola’s "Ballina Beverages" factory; the Old French Road is now closed off at that point. The River Moy forms the traditional county border between Mayo and Sligo. However, the Local Government (Ireland) Act 1898 made the right (east) bank of the Moy, including Ardnaree and Crockets Town (the Quay), part of the administrative county of Mayo. This is a suburb of Ballina. The Battle of Ardnaree was fought there in 1586. Ardnaree Sarsfields GFC is based there. 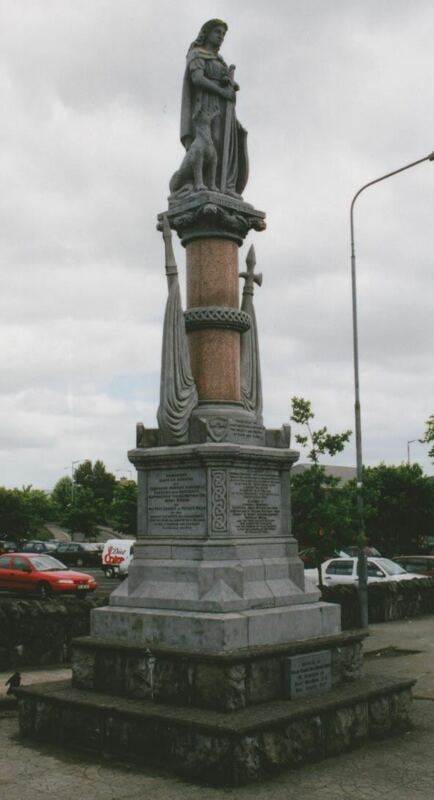 The Centenary memorial (the Humbert Monument) was dedicated on 11 May 1898 to commemorate the 100th anniversary of the French landing at Killala in support of the Irish Rebellion of 1798. The monument was originally sculptured by a Dublin Craftsman but in recent years it has been restored locally. The figure on the monument is not Humbert but Mother Ireland. Maud Gonne unveiled the monument, and at the unveiling event famously poured water over another speaker's (an IRB member) head. The monument was moved to its current location on Humbert Street in 1987, where it was re-dedicated by Maud Gonne's son, Seán MacBride. Ballina has many listed buildings including Georgian Housing on the Banks of the Moy, the Ice House Building which has been converted into an exclusive hotel, and the former provincial bank, which now houses the Jackie Clarke Museum. The streets of Ballina consist mainly of three and four storey Georgian and Victorian buildings, though the structures of several buildings are actually far older. The primary schools that serve the town include Scoil Iosa of the Convent of Mercy (mixed), Scoil Padraig (all-boys), the Quay NS (mixed), Culleens NS on the Killala Road (mixed), Breaffy NS (mixed), Behy NS (mixed) and Scoil na gCeithre Maol (mixed), a gaelscoil situated on the Killala road. There are also at least 3 Montessori schools and many pre-schools. There are three secondary schools - St Muredach's College (all-male), Moyne College (mixed), and St Marys of the Convent of Mercy (all-female). A large, modern facility opened on McDermott Street (convent road) for the 2009-2010 school year to serve the needs of children with mild learning disabilities. It is an amalgamation of the 2 old special needs schools, St. Dympna's and St. Nicholas'. The Newman Institute of education is located in a new campus on Abbey St. It is a charitable organisation working in conjunction with the Catholic Diocese of Killala in the field of Catholic education. Ballina is one of the towns due to have a MAN (Metropolitan Area Network), the ductings and fiber optic cables are in place, but with no ISP Connections. The MANs are being built for the Department of Communications, they will be run by a private operator, but will remain the property of the government. BCRfm (Ballina Community Radio) is the community radio station in the town. The Western People is a local newspaper based in Ballina and until recently was also printed at its premises in the town. It is owned by the Cork-based Thomas Crosbie Holdings. Two weekly freesheets, the Mayo Advertiser and The Northwest Express are distributed throughout Ballina. There is also a monthly magazine called Mayo Now that was launched in March 2015 and previously a monthly magazine called "INK" that was in circulation since Feb 2011. The Connaught Telegraph, published in Castlebar and the Mayo News published in Westport, also carry local news related to Ballina, though are less popular and sold in few outlets. Mid West Radio is the local station with an office in the town. An online news service, MayoToday.ie, also carries news and information related to Ballina; the website, which is based in the town, is one of the first regional news websites in Ireland. Ballina was one of the first towns in the West to embrace local (unlicensed) radio in the early 1980s, and throughout the 1980s had a number of local stations before the advent of legalised local radio in 1989. The stations included: ARW - Alternative Radio West, which operated from Lord Edward Street, Castle Radio - which was based in Belleek Castle, Westward Radio - broadcast from Howley Street (Later Teeling St), Holiday FM and TCR both of which were based on Tone Street. The N26 is the main road to Dublin, it leaves the town south to Foxford, and after Swinford joins the N5 to Dublin. N59 comes from Belmullet and Crossmolina in the west, goes through the town to Sligo to the northeast. The R314 is a regional road to Killala, and then Ballycastle. The R294 goes to south County Sligo via 'the Windy Gap' in the Ox Mountains. It is used as an alternative route to Dublin, via Tubbercurry and Boyle. 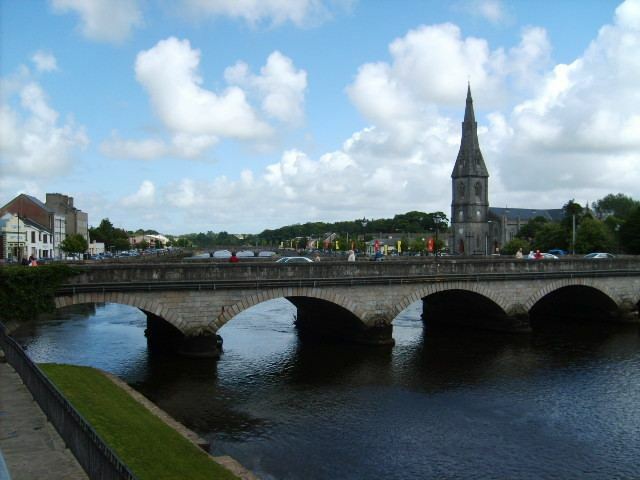 There are 2 main bridges straddling the Moy in the town centre. The first, the Armstrong and West, or Lower bridge, was built in 1835. The second, the Hamm bridge or Upper bridge, was built in the following year of 1836 by Thomas Hamm at a cost of £3,000.00. Both bridges are limestone, and have 4 and 5 arches respectively. Traffic flows in a one-way direction around these 2 bridges and is often heavily backed up on both sides, the reason for calls for a third bridge further down the river. The Salmon Weir Bridge is a pedestrian bridge over the River Moy from Barrett St. to Ridge Pool Rd. The bridge, which was designed to resemble a fishing rod, was opened in July 2009. Ballina Bus Station is host to a Bus Éireann bus depot. Bus Éireann have stated that they intend to develop services similar to the 24-hour Dublin-Belfast route on the Ballina-Dublin route. The route currently runs 7 services a day between Ballina and the capital. In 2007 Bus Éireann launched a direct bus from Dublin Airport to Ballina. A Ballina to Enniscrone bus (which is run by several companies during the summer months) was the first chartered bus service in the country. Ballina railway station is located on the N26 beside the bus station. Departing trains stop at Foxford before terminating at Manulla junction where passengers can connect to trains going to Castlebar, Westport or Dublin (Heuston Station). Trains to Dublin operate three times daily and on Friday evenings a train operates direct from Dublin to Ballina. Ballina is a major rail freight hub, with a direct freight line from the town to Waterford Port transporting pulpwood for Coillte, and as of late 2009, a direct Dublin Port line. This new line is used to transport containers of Coca-Cola concentrate from the town’s plant, removing almost 4,000 trucks off Irish roads. It was suggested in the McCarthy Report the line from the Manulla junction to Ballina be closed, resulting in the loss of these freight lines. However CIE has since stated that it has absolutely no intention to close this line, which it said is the only profitable freight line in the country. Ireland West Airport Knock (Knock Airport, NOC) is about 50.7 km, or 31.5 miles from Ballina. Bus Éireann now runs a shuttle service about five times a day from the airport to Charlestown, from where commuters can get a connecting bus to Ballina. Ballina is the principal service centre in North Mayo. Whilst Ballina is the largest town in County Mayo in terms of area, it has taken second place behind Castlebar in terms of total retail and service sector floor areas. The population of the town is growing faster than its neighbouring hub, but the deficit in its retail and commercial sector also continues to grow. There are a number of national multiple retailers within the town centre, including Tesco, Penneys, A|wear, Easons, Heatons, Shaws and Dunnes Stores which are all key anchors and attract customers to the town centre. While the larger retailers have the most significant proportion of retail space, there is a very large quantity of small, local, high-quality retailers in the town. The Old Newman Institute building on Barrett Street is home to the Ballina Arts Centre, which is currently redeveloping the centre to incorporate a 240-seat auditorium, dance studio, studio rehearsal space, a second exhibition gallery and coffee shop/restaurant. The sod was officially turned on the project on in October 2009. In 2009 the Jackie Clarke Collection went on display when the Clarke Museum opened in the old provincial bank. During his lifetime Jackie sourced and purchased many unique documents that scholars had believed to be lost, including sole surviving copies of publications, rare handbills and proclamations, unpublished manuscripts and political writings. He donated all his collections to the state, under the condition they would stay in Ballina. The town also hosts an annual music festival: Fesant Fest. The festival, held every summer in Emmett's Bar on Hill St., began in 2011, and is organised by a collective of punk/DIY enthusiasts which has been organising gigs in the town since 2000. Ballina Stephenites, is one of the local Gaelic Athletic Association club teams. The name also refers to the town’s Gaelic Athletic Association grounds, James Stephens Park. Ballina Town is one of the town's soccer clubs, playing their home matches at Belleek Park. The town is also represented by Ballina United. In basketball, Team Loftus Recycling represent the town in Men's Division 1. Ballina also has Mayo's only Gymnastics Training Centre, Nadia Gym. Ballina Golf Club is an 18-hole parkland golf course on the outskirts of the town on the Bonniconlon Road. The course is a Par 71 course, 5933 metres long. Ballina is also one of the bigger clubs in the county as regards athletics, with a floodlight outdoor 400m track and a large cross country pitch which often holds the AAI Connacht and Mayo finals. The town also has a martial arts school, Moy Valley Freestyle. This school studies a freestyle form of martial arts. The local triathlon club Liquid Motion holds a triathlon in the town every summer, usually in July to coincide with The Ballina Street and Arts festival. Ballina Rugby Football Club is located in the Quay and compete in Connacht Junior Division 1a.